Home Innovation Faster Than the Speed of Light? Dr. White believes that advances he and others have made render warp speed less implausible. His theory involved harnessing the expansion and contraction of space itself. 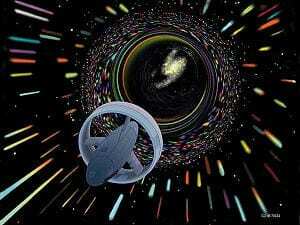 Under Dr.Alcubierre’s hypothesis, a ship still couldn’t exceed light speed in a local region of space. But a theoretical propulsion system he sketched out manipulated space-time by generating a so-called “warp bubble” that would expand space on one side of a spacecraft and contract it on another. He is quick to offer up his own caveats, however, saying his warp research is akin to a university science project that is just trying to prove that a microscopic warp bubble can be detected in a lab. ”We’re not bolting this to a spacecraft,” he said of the warp technology.